Tiếng Anh là một ngôn ngữ phong phú. Người bản ngữ đã sáng tạo ra nhiều cụm mượn từ ngữ về đồ ăn, rau củ quả để miêu tả về con người. Egghead (n): a very studious person, intellectually gifted in the field of academics, a very intelligent person. - Example: I think Jane will do well in her finals. She has always been a kind of egghead from elementary school all the way through college. 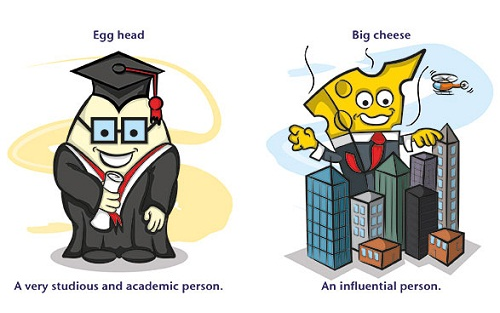 Big cheese (n): an important and influential person. - Example: Do you know Peter? He’s a big cheese at the company, he may help you to get a good job there. Xem nghĩa tiếng Việt tại đây. Couch potato (n): a very lazy person who watches too much TV. - Example: My uncle is a couch potato, you never see him without the remote control in his hand. 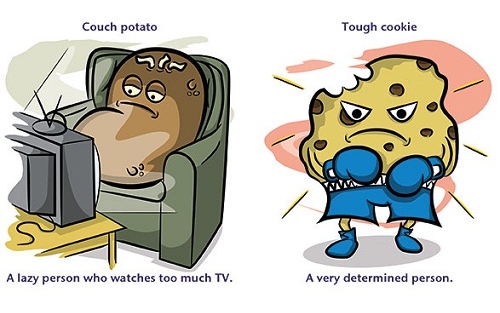 Tough cookie (n): a very determined person, durable and robust person, a person who is difficult to deal with. - Example: There is a tough cookie on the phone, he insists to talk to the manager, shall I put him through? Top banana (n): leader, boss, the chief person in a group, the head of a project. - Example: I don’t know when we’ll finish, ask Jack, he’s the top banana here. 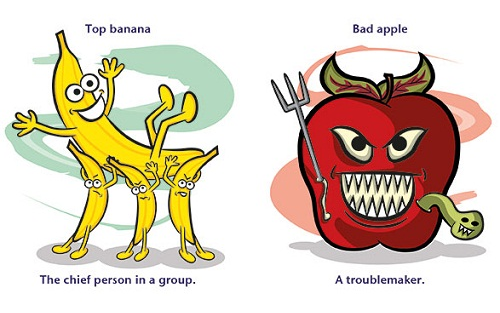 Bad apple (n): troublemaker, criminal. - Example: He’s a real bad apple. If I were you, I wouldn’t let my daughter go out with him. Sour grapes (n): pretending to dislike something that you can’t have. - Example: The losers say they don’t mind that they couldn’t win the cup, but I’m sure this is onlysour grapes. 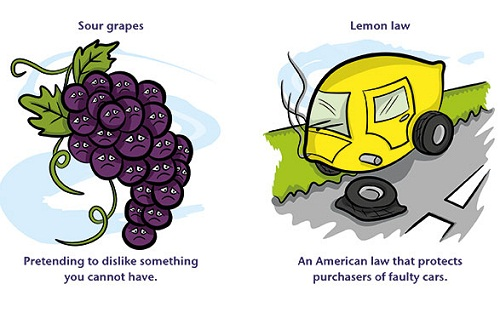 Lemon law (n): an American law that protects those who buy defective cars or other consumer goods. - Example: Unfortunately, his new car had an engine defect, but he received a complete refund in accordance with the lemon law.